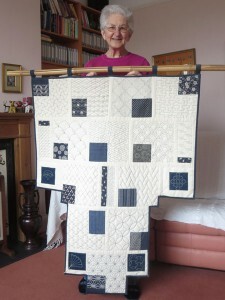 Maxine chose her touchstone as it was the technically the most challenging quilt she has made. 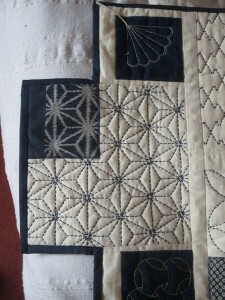 Inspired by a gift of some Japanese fabrics, she created a kimono shaped quilt with sashiko stitching. Maxine also talks about several other quilt projects including a bookcase quilt to celebrate children’s literature and a Winnie the Pooh cot quilt. Much of the second half of this interview relates to Maxine’s role in cataloguing, researching and increasing awareness of the Canadian Red Cross Quilts. Fran Katkar [FK]: So, we can now begin now. The next to us we have Maxine’s touchstone quilt, so Maxine if you’d like to give us the title of it and how you… and first of all if you can describe the quilt and how you came to make it. Maxine March [MM]: Well it’s called Japanese Fragments and one reason I chose it for the focus of beginning the conversation is that it’s probably the technically most difficult quilt that I’ve made. I made it only a year after I’d finished my City and Guilds part one course [noise of microphone]. Erm, it was made, well the starting point, was a pack of fragments, and they were fragments of Japanese fabrics, indigo dyed, with traditional patterns on them. They were bought for me as a person by a Japanese friend for whom I’d being doing some editing. We had done our Master’s degrees together, but her Master’s developed first of all into an M.Phil. and then into a PhD. Erm… she was okay once we were doing her masters because it was a taught masters so she was going to lectures and she was talking with English speaking people. And the further into her PhD she got, working on her own, her English deteriorated to the point where I was asked if I would act as editor for her because I knew the basics of the subject that she was dealing with, Victorian picture books. And, well, I had the skills to turn her English into acceptable academic English. She did the work, she did all the research but I tidied up the English for her. And she went frequently back to Japan on visits to see her family and on one of her returns to England she brought me this pack of fabrics which she bought in a shop in Kyoto saying ‘Maxine I know you take small pieces of material and sew them together to make wonderful things, so I thought you might be able to do this with these.’ Erm… they were clearly off cuts from something or other and none of them were very big, so I kept the pack for quite some time because they were too small, I felt, to do anything without adding something to them and I didn’t want to add anything that would detract from the beauty of the fabrics themselves. And after a long time I finally hit on the idea of using each one as a focus point in a square block and filling the rest of the block with a sashiko stitch. And I did quite a lot of research into the different designs of sashiko and the names of them. FK: For the benefit off future listeners can you just explain what we mean by the term sashiko? MM: Sashiko being a traditional Japanese technique, originally used on old clothing to hold the layers together to increase the warmth in the fabric, and often used on quite open-weave fabrics. So it is only used as a running stitch, so all the interest lies in the different designs. Erm… so I looked at each of the indigo dyed fabrics and tried to pick out a sashiko design that would complement it and sometimes it was only in the sense of the name of it, this one is something to do with fences for example as is this sashiko stitch that goes with it. 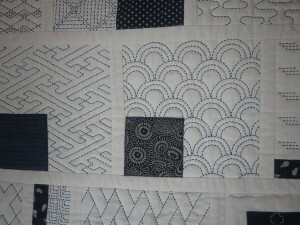 In other cases I took a line – a physical line – from the indigo dyed bits and continued it into the sashiko stitching. It was very labour intensive because I’m not a very keen hand sewer believe it or not, erm. I’m much more inclined to use a machine to get somewhere. But it was very satisfying because I felt it worked. Once I’d got all the blocks done, I then had… erm… I then had the decision as to how to put them together. My first idea was that I would, in fact I’ve got a picture of it here, my first idea was to have them free standing and just held together with two tapes so that you would actually be able to see through it. I realised that that was probably beyond my technical ability to do, so I finished up, effectively using calico sashing. So it’s done as quilt-as-you-go, which… erm…. so this is the only example I have of sashiko in my work and it is the only example of quilt-as-you-go and it’s got by far the most hand stitching that I have ever done, in any piece of work [chuckles]. So, but I am very pleased with the result. It gives me pleasure still when I look at it. FK: Yes sitting here I am very much enjoying looking at each square block and the different fabric with the pattern and then the different sashiko stitching patterns that you’ve used. It is very enjoyable to let my eyes roam over it, and I’ve just done a quick count and I can see really, I think, about 20 different stitching patterns, which is fantastic. MM: Yes. There are 19 blocks in all. FK: So in describing the quilt – the two main colours? MM: Two main colours – indigo and a natural calico that’s all there is in it. All the texture comes out in the stitching. FK: … and the size we have written down, don’t we? MM: Yes, we do [Papers being shuffled]. It’s roughly 40 x 48. FK: Where do you usually keep it? MM: It’s usually hung on hooks in the hall. Erm… perhaps I should point out that the eventual… erm… putting together…erm… kind of echoes the shape of the kimono as well. FK: Yes, it does. Yes, definitely and though at the moment we’re sitting in Maxine’s sewing studio right at the top of her house, a lovely light and airy room, just perfect and I enjoyed looking at this Japanese sashiko hanging on the stairs as we came up. So, that’s its usual home. [MM: Yes] And having made it, how do you feel about this particular piece of work. MM: I’m very fond of this piece of work because I feel as if I’ve done justice to the fabrics, apart from anything else. Erm… and, you know, it’s… I don’t think I will accomplish anything as technically difficult as this again. So it’s a reminder, it’s a bit like exams that you did in the past. You think, did I really know that. It’s, you know, you think well once upon a time I really could do this. So, but I do prefer to work smaller and quicker these days, I have to say. FK: That’s a really lovely coming together of the background, of your association with that particular Japanese friend. FK: And then being challenged technically [laughs]. MM: Yes, and she did get her Ph.D [both laugh]. FK: I’m glad to hear that, [both laugh] and you got a lovely end result too. FK: That has turned into a special wall hanging. MM: Yes, and she has seen it, so she has seen it finished, once. FK: Ah good, and then you’ve got a lot of pleasure from it. FK: Yes, I’m very much enjoying looking at it at the moment [both laughing]. That’s great. MM: The other end of the spectrum is what I’m doing at the moment. Because that’s 1999. And I think there was also a feeling of having finished my City and Guilds in 1998 that I should be pushing the boat out a bit. MM: So I did… [FK: Yes] did do one or two pieces that were technically challenging. FK: We are encouraged to think that way during City and Guilds [speaking over each other here]. MM: The bookcase quilt is another instance where I wanted to make a quilt that looked like a bookcase full of children’s books, because I’d been collecting fabrics that were based on illustrations from children’s books. FK: And is that an area that you have a particular interest in? FK: [interrupting MM] But I remember you just starting the bookcase quilt so I’m actually enjoying seeing the finished result today. MM: Yes, so, eventually it was a series of blocks which looked either like books standing or stacked on shelves, one or two of them with open pages which were the ones where I used the fabrics that were based on illustrations from children’s books. And it was an interesting one to do, apart from the technical side of it , because other people got very interested in it which is where one of the great delights of quilting is the, you know, the friendship and the support that you get from and the interest of other quilters. One or two of the open book pages, for example, were fabrics that were given to me by other people. MM: Yes, and they could therefore choose the title of a favourite children’s book to go on one of my shelves. So again that’s a quilt which has lots of associations for me and one that I’m proud of. Technically as well, because it, you know, I did design the whole thing myself. FK: That was during City and Guilds? MM: It was after City and Guilds. It was immediately following City and Guilds. Again I was at that stage where I really wanted to use a lot of the techniques that I’d been taught in City and Guilds. Much of my work is still very influenced by the City and Guilds course. FK: Inevitably I think, spending those two or three years quite intensively. MM: Yes, but I’ve… Other people I think have gone down other roads through workshops and things. But I keep coming back to it. In fact I still have all my City and Guilds folders. And I probably haven’t looked back at them for a couple of years, but for many years after City and Guilds I would still refer back to those folders for ideas and for techniques and also ideas on design, which is my weakest area as far as quilting is concerned. Erm… I’m more of a doer than I am a designer. That’s… what I’m working on at the moment is a series of cot quilts, again on fabrics where the illustrations come from children’s books. And this started back last year when a friend of mine, who I made on the children’s literature course, was going to become a grandmother for the first time. And she asked if I would make a quilt which, of course I was only too pleased to do. I love working on cot quilts. I love the scale of it. The fact that it doesn’t have to be rocket science as far as design is concerned. In fact quite often simpler is better. Because it’s small, it gets finished quickly and it’s a gift. You know, it just goes. So I don’t have an accumulation of quilts that I wonder what to do with. They all go away eventually. So my friend asked if I would make a quilt for the impending grandchild because we didn’t know the gender. The parents had opted not to know. So it had to be a neutral one and I made a quilt with some Winnie the Pooh fabrics. The original E H Shepherd illustrations, not the Disney stuff, and this is the second one I made with the leftovers. So it was green and yellow. FK: Lovely soft colours. [MM: Yes] Yes lovely. Yes and I can recognise the Pooh illustration, yes. MM: Yes, What was interesting was that I made it before the baby arrived and handed it over to the grandparents and the grandfather wanted to keep it. [FK laughs] and since he’s a rather academic historian I was quite surprised at this. But they were absolutely delighted with it. FK: … that can be read. Yes [laughs]. MM: But the fact that they are the proper illustrations and not the Disney ones, pleased me greatly. FK: Yes, definitely [MM: So…] Yes, It’s true to the book. MM: Yes but, you know, in designing this quilt I had to get out all my fabrics that were based on illustrations from children’s books and that set me off on making other ones. In fact one went off only last week, a Beatrix Potter one. FK: Is that your preference, to go for these traditional patterns to achieve the result that you are after. FK: Yes [MM: Mmm…]. Whereas the Japanese Fragments wall hanging and the bookcase or bookshelf wallhanging, they were one offs and you had. MM: They were one offs. FK: Yes, you had to work the whole thing out from start to finish. FK: What, just backtracking a little, what was the technical challenge with the bookcase? MM: The book case one, well was designing. How do you make a book, how do you make a piece of cloth look like a bookcase? You know, how do you, you know, make open pages so that people will recognise them as intending to look like the open pages of a book. So the blocks had to be drawn out, you know, you had to work out the scale. FK: Was that the solution to divide the book case with the books on the shelves divided up into blocks. FK: And there are things on quilts at exhibitions now where people have had printed text and have embroidered over to make it stand out. [MM: Yes] So you, erm, you were able to print onto the fabric the titles of your books. FK: Well that’s another facility that we have. MM: But it was fascinating because a lot of the design work was done at Morley College in a leisure class and it set off a lot conversation amongst other students about what books they’d enjoyed as children. Erm… And that was very interesting. [Noise of microphone, FK checks recording, FK and MM talking in background]. FK: So, you’ve got this pile of cot quilts next to you, you just mentioned a couple of them. MM: You now, it’s… it just works. FK: And then in between you have white as the contrast. [MM: Yes.] And this pattern is called? FK: You’ve got the zig zags of colour across the top of this small quilt [MM: Mmm.] with the white in between. MM: And then one where I was beginning to run out of the fabrics a bit so.it needed a few plain blocks in between. But today it will go to a baby girl or a baby boy. It will be fine. So I will still make, although I have to confess that… erm… collecting and research is also a large part of what I do in quilting now and has become, it’s become a large part of my life and a very important part. The collecting first of all. FK: So just a follow on of the quiltmaking you would say that really for you you’re making quilts now with a view to the satisfaction of being a gift and finding a home. [MM: Yes] with somebody else. MM: Yes, I don’t feel I need to make any for myself. Erm… all the family, like close family members have a quilt that was made for them. Erm… so we don’t want two quilts. So making cot quilts is a good one because there’s always babies coming along. [FK: hmm, hmm] And it means that they will move on. [FK: Yes] I still do like making though, I do like the actual, the choosing of the fabrics, the putting together, the finishing off. You know, I even like doing binding [both chuckle]. FK: Well that’s the final stage, isn’t it, [MM: Yes] that has its own satisfaction [laughs]. FK: Is that how we come to have some in this country? MM: They were largely sent to this country during the whole of the war. They were sent in unimaginable numbers and the population of Canada was only 11 ½ million, roughly the population of Greater London today. And only about 3 million of those were adult women, many of course were doing the jobs that were left behind by men who had signed up, as happened in this country. Erm… but nevertheless they continued this quiltmaking right through the war, getting ever more ingenious with where they sourced fabrics and how they used them. Erm… and it was largely made by small groups of women quite often based on churches or on the Women’s Institute… erm… often working in rural areas because in the rural areas they couldn’t get to the Red Cross room in the town, which is where the bandages were being cut. So they were working as they had worked anyway before the war started. But they used every scrap of fabric in such imaginative ways. The more you look at these quilts the more you realise that many women couldn’t compromise on design even though they were working with scrap fabrics. For instance, if they ran out of a colour to complete a pieced block they would look for the nearest tone the nearest size of design and that really touches me. And they are, they were, when we first started our research – as I said I worked with two friends – when we started our research we found that there had been very little written about these quilts because they fall between two countries the Canadians are not so interested because they are scrap quilts that all went out of the country and in this country they are not part of the British tradition of quilting. So again there seemed to be no place for them in quilting history. So it was our fortune that we hit on an area of research which would was virtually untouched. FK: They were made for practical reasons. FK: But you are saying that there was a lot of input that was… that elevated them above just being practical objects. MM: Yes, yes. 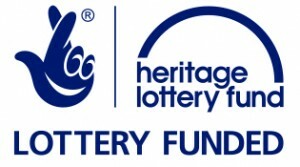 And we wanted to identify as many of them as we could that were either in private hands or in museum collections, so that people who were interested could go and have a look at them. And we also wanted to look for exhibition space. We just wanted, as part of raising the profile, we wanted to get them in exhibitions. We wanted to get them somewhere where people could see them and where we could explain why we thought these quilts were important and significant and worthy of study. FK: So how many have you actually saved and where is the home for the collection? MM: Erm… well the three of us hold quilts independently where they have been given to us or where we have personally bought them. But we consider the collection as a whole when we are looking to have an exhibition, for example. So our whole collection now comprises 75 quilts. And considering that we had a celebration lunch when we first got to 20 quilts I think we’ve done pretty well. We formed the group in January 2009, so we are now exactly 5 years on. FK: How did you… did you put out an appeal… to get these quilts? MM: One of the things that we did to raise the profile that we gave talks about the quilts – all three of us will give talks to anybody who cares to listen. And many of the quilts we get come through the talks. In fact I’ve had three quilts recently. They’re downstairs actually. One was given to me at a talk I did in Aylesbury in October. A lady who came to the talk, it was a group of embroiderers, a lady who came to the talk had brought the quilt to show me but in fact what she was doing was sounding me out to see if I wanted it. We never turn a quilt down, because any quilt you get will tell you something else about these quilts. So, in fact, the one that she brought was American not Canadian, because the Americans did make them but not on the scale that the Canadian women did. So this was an American one. FK: So that was also under American Red Cross? MM: It didn’t come through the Red Cross in America, they had… set up a special scheme called Bundles for Britain in America and it was masterminded by a most forceful woman as was the Canadian one. There was a very forceful woman who masterminded it in Canada. FK: Really just one such? MM: Well, she was the mover and shaker and she was employed by the Red Cross in Canada and the reason they are called Red Cross Quilts is that the Canadian Red Cross was the organisation which collected up all these quilts as well as all the other stuff that came over to this country. They collected it up, baled it and arranged for the shipping and it came, first of all to the British Red Cross in this country and then it was sent to local authorities and the Women’s Voluntary Service. And they were largely responsible for the distribution. Erm… and they went to… largely to people who’d been bombed out, who’d lost all their possessions. But we have examples of ones that were given to hospitals, to children’s nurseries, to refugees, to people who took in evacuees. Erm… all sorts of people, Land Army girls, anybody who’d been moved about because of war, because that’s one of the things that created a shortages of bedding. People who kept being shoved around from A to B when they got to B needed bedding. The evacuees needed bedding, the Land Army Girls needed bedding, so, you know, there was a growing need for it. MM: Yes. But the last one I got only about three days ago, came again, came from somebody who had heard a talk that I gave to a group of embroiderers. And at the end of the talk she came to me and she said, I’m sure there’s one in my father’s effects because I haven’t cleared his flat out, he’d obviously deceased. But when I do get round to it would you be interested? So I left her my contact details and it just arrived in the post and this is two months after the talk – no more than that. Erm… but it’s an absolute purler – it’s a cot quilt, it’s applique, it’s just wonderful. FK: I hope we might be able to have a little look… [MM: Yes certainly.] Take a photo. MM: But you know from… [FK: That’s exciting.] listening to this talk what happened next was one of the three members of our group, before the group was established worked in a charity shop and one day when she went in to do her stint, somebody said, ‘Oh, I’ve put a couple of quilts aside for you because I know you’re interested in that sort of thing, so before I throw them out I thought I’d let you have a look at them.’ And they were Red Cross Quilts. They can be identified exactly without doubt by a label that’s put on every one by the Red Cross and it just says ‘Gift of Canadian Red Cross Society’ with a little red cross on it. FK: You are showing me a picture, so it’s a white square with the Red Cross in red and the name of the organisation in red. MM: Tiny. Yes it’s about 1 inch by 1½ inches and there are variations. Sometimes you see the Province or the city. The nearest city, is printed on it. FK: That can be anywhere on the back. FK: And have some of them stayed with the family of the original? MM: We’ve identified ones where the original don…. you know, the original recipients still have them… Erm… And, quite rightly, you know, I think these things… we always say if we’re offered one, we say ‘can you check there is nobody in your family who has an attachment to it.’ You know, we will take in any Red Cross Quilt that we are offered. But I think it’s important that these things stay with the family as long as there is somebody in the family to respect it and value it. But, of course, as it goes down through the generations that sort of emotional tie gets diluted and many of the quilts that come into our collection have come from people who know jolly well that when they finally will turn their toes up, you know, that… erm…. You know, the house clearance will probably mean it goes to the tip. Yes, so… but it is an important part of my life. FK: This is an unfolding story that you’re very involved with. MM: It is, yes and as far as exhibiting is concerned I think, probably our best achievement was to get one into the V&A’s big exhibition in 2010. The… because the V&A doesn’t have a Red Cross Quilt [chuckles]. MM: But we’ve also had you know, major exhibition in The Quilt Museum and Gallery in 2009 and The Sewing in Wartime one and more than half the quilts in that exhibition came from our collection and we did co-curate it and I wrote part of the catalogue for that. The first real catalogue that The Quilt Museum and Gallery had had. Erm… but we’ve also had smaller exhibitions. Lymington in Hampshire last year borrowed some of our quilts for their D-day celebrations, Maidstone Museum gave us some space. FK: And that catalogue is, that is the small book about quilts that I enjoyed reading [MM: Yes] Yes, Lovely background and history and lovely photos of them as well. FK: This is clearly an important part of your quilting life and development. MM: It is, yes, so… but you know as far as talks are concerned I had 15 bookings last year so between the three of us we must have done about [noise of microphone] 30 bookings, 30 talks. Erm… then it’s to quilt groups, embroidery groups, general textile groups, local history, erm… WI’s, so… [FK: Wide range.] So we really have put the word out and I mean certainly in the quilting world these quilts are recognised and acknowledged now and erm… Yes, in the wider world as well. So that’s one aspect and the… that in itself led to me joining the British Quilt Study Group, the Specialist Group in the Guild. FK: Ah, I was wondering if that’s how it happened. MM: And… erm… yes, I mean I was asked by a member of the BQSG if we would have some of our collection in the Loch Lomond Quilt Exhibition, which we did and in fact we had our complete, it was the only time we have ever seen our complete collection together, because the three of us live in different places, so we don’t often have an opportunity to get together. FK: And that would have been exciting in itself. MM: And I was in another venue and most of them offered tea and cake, being quilters, and I was having my tea and cake in conversation with some other people and a woman turned to me and she said ‘Have you seen the Red Cross Quilts? If you haven’t you must. It’s the best thing here’. So we were very heartened by that and it was it was so exciting to see our whole collection in one place. And we were given a wonderful church to do it in. FK: So at the time the collection was 20? MM: Now we’ve got 75. MM: Yes. So that includes the three, no they are all registered as they come in. FK: And that’s really in quite a short time. MM: Yes, so it’s almost, you know, once the ball starts rolling. FK: Yes and maybe the right thing at the right time. [MM: Yes, quite] otherwise some of them would have been disposed of. MM: Yes, yes, [FK: and lost] so yes, you know I’ve been a member of BQSQ for four and a bit years now. FK: And how did that lead on from the Canadian Red Cross Quilts? MM: Erm… well I started doing research on a particular Red Cross quilt, not one of mine but one in the Imperial War Museum. And decided to offer it up as a paper at one of the BQSQ seminars. It’s a very unusual one, you know. It is said that each of these quilts has nearly always got something about it that you haven’t noticed in any of the other quilts. But this was a particularly striking one. It’s what’s known as a Roll of Honour Quilt and the Americans do it quite frequently and they still do it. Erm… they will record the names of serving soldiers on a quilt and it will be put on public display typically in America. FK: I’m looking at a photo of it. Could you just sort of describe the pattern? [MM: Yes] and the structure of it? MM: Yes, it’s a series of, what is it, it’s four by five so it’s 20 blocks. It is a block quilt and it’s, I think it’s called – it’s not a Friendship Star but it is a particular sort of star but only with four points to it. So each block has a red star with four points on an angle. Between the points – it’s on a calico background so between each of the points of the star is a name embroidered and each of the names is a serving soldier, airman or sailor. And the names often have their numbers and their rank and sometimes their occupation. Sometimes, for example it says stoker or driver but… erm…. I saw it in the Imperial War Museum on a trip to register, because we do register every quilt we see. So I was with one of my friends registering the Imperial War Museum Quilts, of which they have about five I think, some of them First World War. But before we saw the quilts we caught the Remembrance Day Commemoration in the Atrium of the Imperial War Museum which was a most moving thing. And someone read extracts from a recently published book of Memories of the First World War and the two minutes silence was held after that and the end of the two minutes silence was broken by a bugler appearing on the balcony above us and playing the Last Post. So we then went up to one of the private rooms in the Imperial War Museum and the first quilt that was opened up was this roll of Honour Quilt. So it touched my heart and because it had the name of the place in Canada where it had originated I followed that up, with some difficulty and if it hadn’t been for Margaret Cooter I would probably never have found where it came from. Although sewn into the border of this quilt was the words Marchant Grove, Sask. for Saskatchewan. I couldn’t find Marchant Grove but Margaret Cooter suggested that if I wrote to a newspaper in Canada and said what I was trying to do and why I might get some response. FK: And you had an ideal helper there with… [MM: I did] with Margaret’s Canadian background [MM: Absolutely] and background in journalism. MM: Yes, I did certainly, and you know a quilter, so she knew the importance of finding this place. So I did. I took the biggest town nearest to the centre of Saskatchewan, Prince Albert and wrote to the editor of the newspaper and got some amazing responses from all over Canada. And it worked out that Marchant Grove was only 30 miles from Prince Albert. MM: … had been a small place. It had a Post Office, and a General Store but it had never been a big place. FK: And that had been around, what time? MM: It was started in 1911 and the original store and Post Office is still there, it’s just a private house now. But the nearest small town to it is called, well, it’s not even a small town, a small town by Canadian standards, there are 300 and something people in it, is Camwood and many of the people in Camwood, you know, have lived in Marchant Grove when it was a more thriving community. And I was again hugely fortunate in one of the people in Camwood who was touched by this quilt in the same way that I was. Doris Schwar [sp?] she’d lived in the area all her life, she’d been a teacher in one roomed schools in the area and she knew everybody. She knew families of people whose names were on the quilt and she was very active in doing research in Canada. So what I set out to do was identify, two things; identify who these people were from the quilt and there were 78 names altogether, but somebody got their name on twice and one of the blocks only had three names not four. So there 78 names and I identified over 50 of them. But I also wanted to know who made the quilt. FK: Is that like England and Scotland where you get surnames which are local to the people around so a lot of the families would perhaps know. MM: Not so much because these were all… some of them were first generation settlers, so they could have come from anywhere and the rest of them were the second generation. It would… I mean the settlement of Canada is even more recent than the settlement of America. FK: Some of the families are still in the area? MM: Yes. I mean Doris Schwar is Swedish in origin and although she was born in Canada her two eldest siblings were born in Sweden. The family came over, her parents came over with two children and had another two children once they got to Canada. So it’s that recent, so, you know, there were names that were Swedish, German, Ukrainian, as well as names that could be Scottish, English… [FK: fascinating] Yes, so I did find out who many of them were and I contacted families to get family histories, some of them they came up with photographs, some of them, you know, of the men in uniform or the women because there were three women on the quilt as well, which again they didn’t take women into the armed services until quite late in the war and they take them in as civilians but not in uniform. But there are a few women on there who did finish up in uniform. And it touched the hearts of so many Canadians. I did go over too, because at some point in the search I opened up my email one day and it said ‘I understand that you’re researching a quilt made in Marchant Grove and I think my mother-in-law worked on the quilt’ and she was 90, she was coming up to 90 then and I thought if I don’t go now I shall have missed my chance. And we’d another sighting of someone who probably worked on the quilt but she was already in the late stages of dementia. But… erm… I went over and I went over and I met Maisie and she remembered working on the quilt. She was a young bride and I think she must have come in towards the end of the making of the quilt because it was made over quite a long period. But she could remember doing quilting, but she couldn’t remember anything about where they got the fabrics from or who chose the design. But she could give me names of people who’d worked on it. Because it’s such a small community it’s almost certain it was the Women’s Group of the local Church… erm… so..
FK: But this would be a piece of their history that people there wouldn’t have been aware of? MM: No, no. In fact I’ve got the Minutes, I’ve got a copy of the Minutes of the Ladies Aid Committee in the war years. So it’s got a list of the members in it and you know it ties up exactly with the names that are on the quilt. It’s been fascinating to do, so… yes… So that grips me even more than the making of the quilt. FK: As a member of the British Quilt Study Group you, all your research, you then produced as a paper. MM: Yes, I did it as a paper at a seminar in Wales, because our seminars move round the country to give people equal opportunity to get to them, but this one would have been 2012. FK: We’re looking at a small volume that your paper is in. MM: Yes, it’s the journal of the British Quilt Study Group, Quilt Studies. So all the papers are delivered at the seminar in Aug… in October. And then they are edited for publication and the Quilt Studies comes out in May and every member of the British Quilt Study Group gets a copy of the Journal, but it also goes to museums and academics in America and it’s for sale in The Quilt Museum and Gallery Shop. FK: Now you’ve become very motivated in this area of quilting [MM: Mmm] And would you say that this is a kind of pioneering area? MM: Absolutely. You know there’s references to Canadian Red Cross Quilts in a few publications but nothing in detail, nothing at all. FK: And you had a lovely comment from a member of staff at The Imperial War Museum [MM: Yes] about the kind of research that you were able to do. MM: Yes, my initial research was before I got into the academic standard required for a paper. I did put, well I made a paper copy but I also put it on disc and took it back into The Imperial War Museum to offer to the Curator to say ‘Would this be of any use?’ and they did say that it’s the kind of research we would love to do if we had the time to do it. FK: What a wonderful comment. MM: Yes. 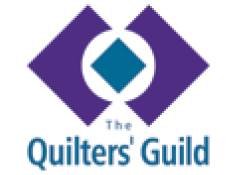 You know the British Quilt Study Group is very supportive for people who want to do so. There are some very experienced researchers and some people very knowledgeable about quilting and the history of quilts, although the Study Group doesn’t just do historic stuff, it does contemporary work as well. But, there is an enormous amount of support there for anybody who wants to get into quilt research. But to be honest anybody who’s done family history research will have honed the skills that you need for quilt research. You might not have all the contacts and you might not know where to find everything, but you have the skills if you’ve done that kind of research. It is immensely satisfying. FK: So really this is, I think I’m getting that this is really a very wide area that’s there for people to move into and a valuable area of our quilting. MM: Absolutely. And I think with the demise of The Quilt Museum and Gallery that, you know, it will become even more significantly important in quilting in this country. The British Quilt Study Group’s research is highly regarded in America and the two people who went over to the International Quilt Study Centre Conference last year or the year before, they took as many copies of Quilt Studies with them as their luggage allowance would allow and they all sold within the first day that they were there. It’s a… but there are, you know, museums and collections in America who are friends of the BQSG in order that they have access to our research. FK: In a way this is parallel to what we’re doing with Talking Quilts. [MM: Yes] it’s recording a vital area of our quilting history [MM: Absolutely] and then that in turn will become a valuable resource for future quilters. MM: Yes. Although I don’t belong to a big quilt group anymore because it wasn’t really meeting my needs. Erm… I do belong to two small house groups which again are very informative because there I get critical appraisal of work, which is very useful. It could be as simple as I don’t know what to do with this, and somebody will say ‘you could do this or you could do that’, or get to the stage where you want to quilt something and you can’t work out a quilting design that will complement what you’ve, you know, the top. And people come up with practical ideas. It’s deeper support than that and these two house groups, one of us meets once a month and the other meets once a fortnight in each other’s houses. They’re very small groups. One of them started from the City and Guilds and the idea was to carry on, to make sure we carried on quilting and didn’t let other stuff in our lives seep back in and take up the time. That’s the group that meets once a month. FK: And that group continues? MM: And the rules were set down from the beginning. We meet in each other’s houses, the hostess does not provide lunch, you bring your own lunch because then it doesn’t deteriorate into a luncheon club. The hostess is allowed to provide cake and fruit and you don’t have to clean up specially because you’ve got a house meeting. [FK: very good rules] [laughs] And those rules were taken over into the second house group which again came out of Morley – I haven’t said enough about Morley College because Morley College has been very influential in my quilting life, starting with the City and Guilds which I did with Jenny Hollandale who I found to be an excellent tutor, absolutely excellent. And, you know she’s become a personal friend which again has, you know, enriched my life. But the second group came when people – some of us from City and Guilds stayed on to do leisure classes with different people. FK: Because Morley were running quite a number of quilting classes, yes? MM: Mmm, so we wanted to keep in touch and then we decided that we didn’t actually need a class, what we really needed was a sort of workshop situation so we found a tutor, we just wanted to take work along and have some sort of critical appraisal of it … erm… so we did that, but Morley wasn’t terribly co-operative. The room always seemed to be needed for something else on the afternoons we were hoping to have it. And in the end we gave up and decided we’d just meet amongst ourselves. So, erm… so that’s what happened with that one. FK: Do you actually take work to do or is it more discussion? MM: Well, we don’t sew. FK: Yes, but a lot of work you wouldn’t be able to do it. MM: We meet across lunchtime so much of the talk goes on over the lunch table. And it isn’t just quilting, we exchange ideas about exhibitions that are on in Town. We do have a couple of jaunts a year and it might be to The Quilt Museum and Gallery or it might be to an exhibition somewhere else. Or it might be to a shop. MM: Yes, well, it’s not always in London. We’ve had a jaunt up to Compton Verney to see a textile exhibition. But, it’s very useful. It’s very supportive. FK: It was all part of the feeding process [MM: Absolutely] on the ongoing developments. MM: But no, at house groups we take along work in progress if we have any in progress that’s at a stage that we want to talk about. And, you know, you get critical appraisal from people you have confidence in. You don’t mind if somebody says ‘do you mind if I say that fabric isn’t really working’ [laughs] You know, we… erm… you know we have a lot of trust in the group so, you know, people can speak out without, you know, giving or causing offence. FK: That would be the benefit of having continuity over… [MM: Yes, yes] a number of years. [MM: Yes] That being what… erm… sustained you rather than for going for more different courses or say workshops? MM: I’m not a great one for workshops. I mean I have done them in the past and you, know, some of them I have followed through. But I haven’t, I haven’t internalised what I’ve got from them in the same way that I did with my City and Guilds. Erm. I’m not saying that I’ve you know, never done anything that I didn’t do in my City and Guilds. I have but… erm… it’s more or less been a one off or all too frequently a UFO if I’m honest. Erm. I usually find working to a timetable quite difficult, you know, you’ve only got this afternoon or this day when you’ve got to get on with doing this stuff. FK: And sadly when you have workshops you do hear people at other tables saying ‘Once I’m back to normal routine this is just going to be left in a cupboard’, which always seems very sad. MM: Yes, I mean I have completed things that I’ve done in workshops, I’m just trying to think…Oh, that kaleidoscope technique. I was… I did go to a workshop for that and I did finish what I started there. And I did start another one which is in the cupboard waiting to be sewn together. FK: … but coming back to an earlier comment, you said really that your City and Guilds coursework had become like a reference tool for you. MM: All my samples and I used to go back, not regularly, but you know, I would go back several times a year to look at things that I’d done and for ideas. MM: [talking over one another] My economic status as well, you know, when I did a lot of dressmaking. We had two rather unhappy years living in Scotland where my teaching qualifications weren’t accepted. So I couldn’t teach and actually I wouldn’t have wanted to teach in Scotland at the time they were still using the leather belt to hit children. It wasn’t very nice. And I had two small children and I had done some dressmaking before, but, and of course I had two daughters, so there was more of a purpose in dressmaking then. And, I did a lot of dressmaking then which did make me very nifty with a machine and with finishing off techniques and things like that. FK: Fabrics were available then. MM: Yes, and of course it was economically viable to make your own clothes then, But once cheaper, well two things, three things… First of all we came back to England and I went back to work so I didn’t have the time. Secondly two daughters grown older were not so keen on wearing home-made clothes, they wanted what Tammy was selling at the time. And of course with cheaper ready-made clothes and fabric and patterns getting more expensive it wasn’t economically sensible to, to do dressmaking any more. But I never threw the fabric, I never threw the scraps away. When I was dressmaking I did make some coverlets for the children just from squares left over from dressmaking. FK: Ah! So that was the beginning of your patchwork career. MM: that was the very beginning of my patchwork career and there will be other people who remember the patchwork dogs which appeared in women’s magazines. You needed 96 squares to make patchwork dogs and I did make a patchwork dog for each of the girls as well, which sat on top of radiators for years. And I don’t know what happened to them, but I don’t know what it was when I finished my Masters I knew I wanted to do something with my hands and something with the other side of my brain so when the tutors of the course gave me my results and said ‘well what are you going to do now?’, the correct answer would have been ‘I think I’ll go for the Ph.D’. But the words that came out of my mouth without passing through my brain, I swear was, ‘I’m going to go and make a quilt’ and I did, you know, I went to the end of term display of student’s work at Morley because I thought, I do want to do patchwork, but I don’t want to fiddle around on my own. I want to do a proper course. FK: Did you already know about Morley? MM: I didn’t, no I just looked at where you could do patchwork and quilting and Morley was easily accessible – it’s on a bus route from my home so that was fine. So I went to what would have been the City and Guilds exhibition and I went round and round and round and round, and I looked at the folders that students had left out and I looked at the course requirements and I hummed and ha’ad and hummed and ha’ed until eventually Jenny Hollingdale comes up to me with the application form to join the course ready signed by the tutor because you had to be approved by the tutor as being capable of benefitting from the course. And she said ‘For heaven’s sake woman go across the road and register’ which I did [laughs] and that was the beginning of my acquaintance with Jenny. FK: I think I had a similar experience. [MM chuckles and then both laugh] I think I was pointed in the same direction. MM: Yes, I kept on going back to her and asking questions about the course which she patiently answered and I do remember that I said to her at some point ‘Will I have to wear a thimble?’ Well, because my background at home was, that my mother had designated me as the academic one of the family, therefore I was useless with my hands. Erm… which largely, I think, came from the fact that I hated knitting, but no, she convinced me that I was no good with my hands. But having had this experience of dressmaking I thinking ‘Well I am good with my hands, I can do it’ and I actually find it very satisfying. But the other reason my mother said that I would never be any good at making things was that I couldn’t wear a thimble. If you won’t wear a thimble you’ll never be any good at sewing – [chuckles] so, you know, I remember asking Jenny ‘Will I have to wear a thimble if I take this course?’ [Laughing as she speaks] Really silly of me to think of that. And she said ‘It’s your finger, you decide’ [still laughing]. FK: That sounds like a Jenny answer. FK: How fortunate [MM: Yes] and look where that’s led to. MM: Absolutely, a large part of my life now. The only things I spend more time doing, other than things to do with quilting, is reading. FK: I remember when I first met you, I think you mentioned that you had just retired. Has this been a very satisfying way to spend these days of your retirement? MM: Yes, absolutely, because it’s also led me into the art world, because I have no art education at all. The kind of primary school I went to, you couldn’t do Art. FK: And after so many years with books and words perhaps you just… [MM: Yes] felt the need to move into a different area. MM: Yes, yes, I’m still not good with Fine Art – I’d rather have something a bit more substantial. Something sculptured, collage textiles. FK: Given that the quilting exhibitions have become so important in recent years, when you attend an exhibition what do/ you look for and notice in the quilts… [MM: Mmm…] that you see there? MM: Erm…I have been to Birmingham, I think, every year since it started, to the NEC, to the Festival of Quilts. For the last three years I’ve said, ‘I’m not going this year’ and in two of those years when the programme has come out there has been something that I thought, ‘I would really like to see that’. So I’ve gone again and last year I went because I was on the committee with the BQSG and they have a stall there as part of the Guild stall and you know, you feel that if you’re on the committee you’ve got to pull your weight, so I did go in, basically to the stewarding on the stand. Erm… so the answer is in a big quilts show like that there was a time when I would have paced all the aisles looking at everything. And now I realise that is not the way to do it. So I do spend some time, when I first go in with a cup of coffee and a catalogue and I go through the catalogue and work out which of the galleries I really don’t want to miss. And I do those first while I’m fresh. I found out that I have an aversion to pictorial quilts. And I don’t go and see the pictorial quilts and I don’t go to the Traditional Quilts because they all look the same [laughter]. Well, what can you do, I mean you can get technically better at it but I’ve seen Traditional Quilts and I don’t need to see any more. FK: So you home in on the…. MM: But I do look at the Contemporary, but I also go through the catalogue to see the Exhibitors and I look for names. I look for my friends so that I make sure I see my friend’s quilts. I look for quilters I know and I look for the names of people who’ve done work that I’ve admired in the past and I just look at those. Because there’s just too much at Birmingham. You can’t look at it all. FK: Yes, it is a bit huge. MM: And I never look at the Miniatures until I’ve met the third person who said ‘Have you seen one of the Miniatures – it’s amazing?’ And I think, ‘Oh God, I’ve got to go and look at the miniatures’. FK: And how do you feel about the ideas that other people have, how they carry them out? MM: Erm… well, you know the two house groups, you know I’m, just full of amazement at what other people come up with, because you know we all, you know, quilt very differently. And different amounts of quilting. Some of the members are very prolific and some are quite interested to do the odd quilt from time to time. FK: For you, what do you think makes a good quilt? MM: What makes a good quilt? Ooof… depends what you want it for, doesn’t it really. You know, if you want it on a bed then, you know, does it fit the bed, you know. Does it match the rest of the furnishings? Does it say anything either about the person who made iit or the person whose receiving it? Erm I think if it’s going to go on a bed then certainly the person who is going to sleep under it should be pleased with it. Erm, but if it’s a small wallhanging then, you know, the world’s your oyster, because if it doesn’t work what have you lost, you know, not a lot. FK: Are you a bit too precious about these things? MM: Erm… well, I mean when I look at quilts in a show, there are two things, you know – it’s either ‘My god how wonderful I could never do anything like that, isn’t it good’ or ‘That’s an interesting idea, I’d like to fiddle around with that at some point’ [chuckles] Those are the two things that I really get at quilt shows. You know quilt shows like yours in London Quilters, that’s what I come away with, you know. ‘Gosh that’s amazing’. You know – ‘that is really impressive I really enjoyed looking at that’ or ‘that’s an interesting idea I could run with that one possibly’. And that’s the only thing I would take photographs of if it was a technique that I thought, you know, that I could incorporate into my own work. I don’t take photographs of quilts that I think ‘God, that’s wonderful’ because I know I won’t do anything with it. You know, there’s no point. FK: Yes, with your own personal direction in mind. FK: Yes And to do Birmingham in one day [MM: No, no] Yes, whereas London Quilters is usually about 50 pieces of work, large and small. MM: Mmm. And there’s somewhere to sit down and have a drink. FK: And the final question is just, why is quiltmaking important in your life? MM: What would I do. FK: It’s pretty well covered. MM: Well I think we have and it is. Erm. You never meet a nasty quilter. I think quilters are extremely generous with sharing their ideas, their techniques, with helping out, you know, oh I’ve got a piece of fabric that might do. Certainly with my house groups. [Long pause and noise of microphone, then talking in background]. MM: Well I think it’s a very a broad church, you know, if you want to go on making traditional quilts, you know… Some of the stuff I’ve got are traditional quilts and I’m perfectly happy with that and you know if people want to make them out of paper and stone and bits of plastic, I’m equally happy with that and I think it’s… I think that’s one of the satisfactions of being in the quilt world that almost everything goes. FK: Yes. People can find… [MM: Yes] some area which suits them. MM: Yes… or areas. You know if you want to make one out of paper one day and make a traditional quilt block the next then it’s all there, it’s all there, there’s room for us all. FK: Lovely point to conclude on [both laugh]. FK: We’ve got plenty. We’ve roamed around. We covered lots of lovely areas. [MM: Yes] I thank you very much for sharing your personal quilting stories with us for the benefit of the Talking Quilts project. And as I said before if we happen to remember anything in the next few minutes while we’re taking the photos we switch on again and add and add. FK: Fine. Well, thank you very much Maxine. FK: It was really enjoyable.